Alkor Technologies provides a large variety of custom optical mirrors. Our protected aluminum mirror coating consists of an aluminum layer and a very thin protective SiO2 overcoating. Compared to soft and sensitive unprotected bare aluminum coatings, our protected aluminum coatings are harder, more durable and more resistant. Protected aluminum mirrors are used as ultraviolet mirrors or broadband mirrors, featuring high reflection from the ultraviolet to the infrared light range. 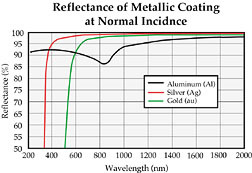 By adding dielectric overcoatings the reflection of our protected aluminum first surface mirrors can be modified and increased at special wavelengths or reflection ranges. Contact our Sales team for pricing! Just ask our Sales Team for your customized protected aluminum mirror. Standard protected aluminum is our most popular optical mirror coating for application in the visible and near infrared. SiO is typically used as an overcoat to protect delicate aluminum mirror. This treatment provides an abrasion-resitant surface while maintaining the perfomance of aluminum mirror. Ravg > 95% from 2 - 20 µm.